The unfortunate have filed from the lottery room leaving the winners to celebrate. Having yesterday won the right for today’s hike into “The Wave”, we awoke still lauding our good fortune. From yesterday’s misstep, we could see how easy it would be to get lost for a few hours on a hot afternoon, and run out of water. People die on this hike. Taking the ranger’s advice to heart, we had the “10 essentials,” including almost a gallon of water each, a compass, and a couple of copies of the BLM map. The map shows compass bearings at half a dozen points along the way, as well as photographs taken from each point. Much of the path is unmarked and over bare rock, so it’s important to navigate by the suggested landmarks. Along the way, the route passes from Utah into Arizona, but there’s no sign marking the border. Near the trailhead en route to The Wave. They can always find me from the air with that shirt! We had a nine AM start from the parking lot that served the North Coyote Buttes. The May air was still brisk, but the sun was already hot. The directions were good, and we had little trouble staying on target for “The Wave”, about 90 minutes distant. 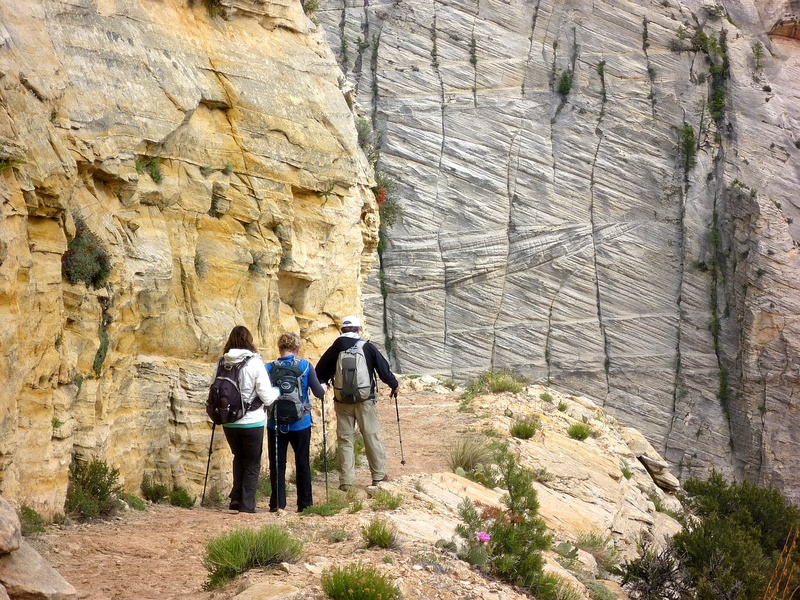 From most of the high points along the route, you can see the distinctive cleft in the rocks above the destination. During wetter times, this cleft is apparently a waterfall. It didn’t hurt that Darcy had been there five years before – Marty had unfortunately been Number 11 that day. This is what much of the route to The Wave looks like. The desert landscape is surreal. The colors of the hills range through every shade of red, yellow and brown. The shapes are equally striking: one set of hills resembled either a row of giant Hershey’s Kisses or perhaps mega-dinosaur coprolites. 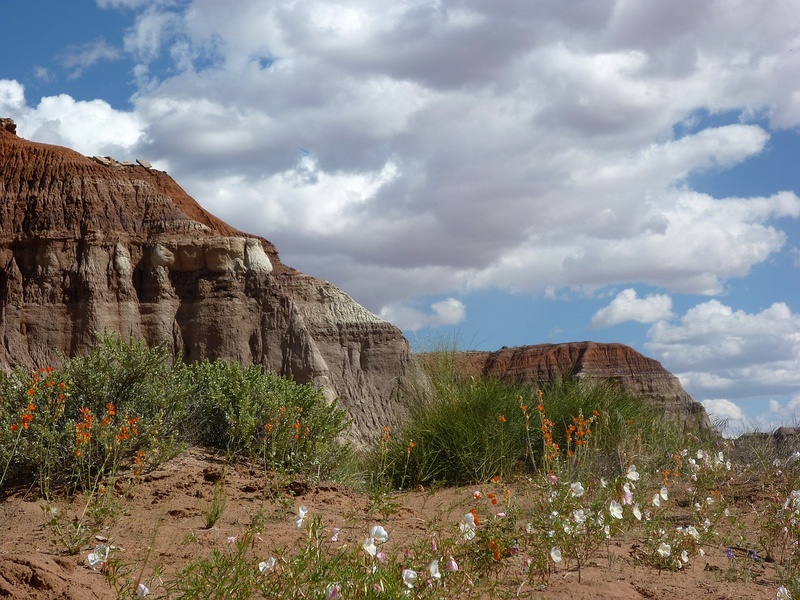 Although we didn’t see any, there are signs of dinosaurs in the Jurassic era rocks. Looking down, we could see hundreds of fossils; they resemble ancient brain corals, but are probably be something else entirely. 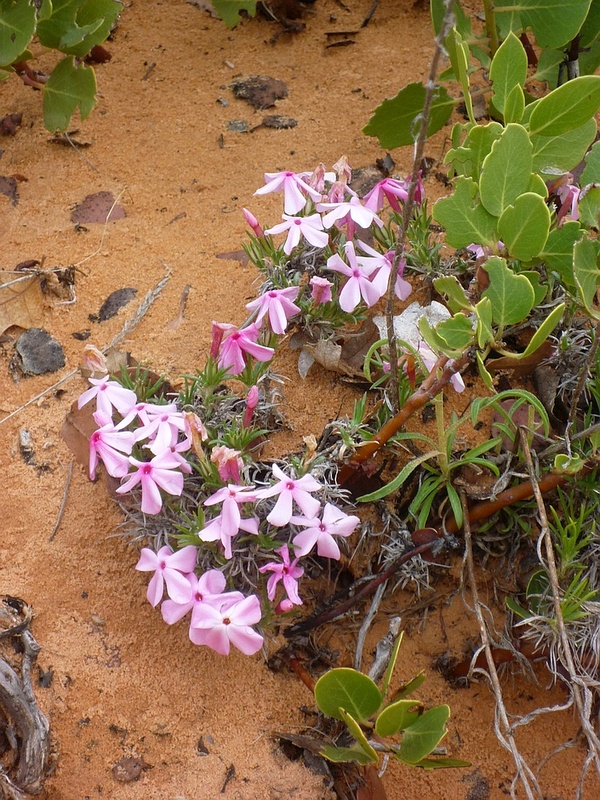 In the few areas they could get a foothold, wildflowers were in bloom in pink, yellow, and lavender. 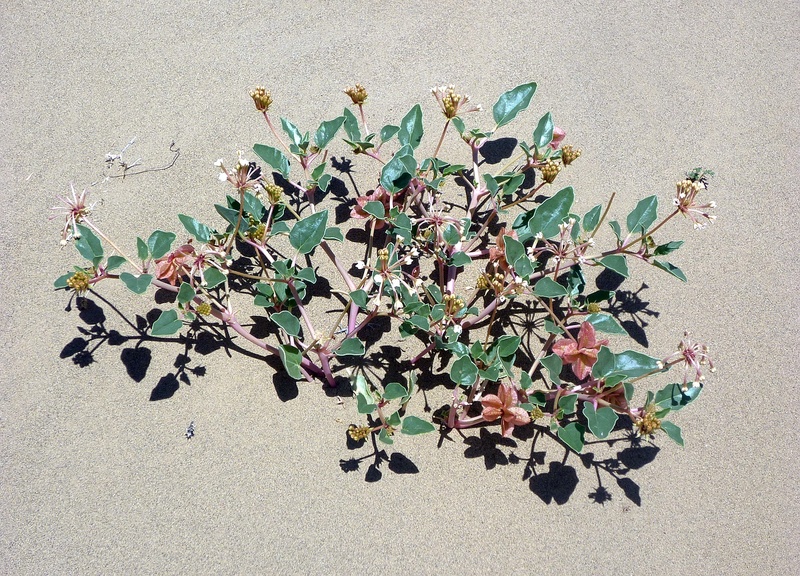 Wild lavender grows in a patch of sand showing tracks from the past day or two’s hikes. The wind will erase them. Suddenly, without warning, we’re at the entrance to The Wave. It’s impossible to do “The Wave” justice with either words or pictures. Being in the middle of it is magical. It’s a small smooth-sided twisty gully with undulating stripes of shades of yellow and ochre. By leaving early, we arrived at “The Wave” before the majority of the day’s twenty hikers. Of this we were glad, as being there alone enhanced the visual experience. By the time we left, there were about a dozen people wandering around the area, and it felt almost crowded. But there was a certain camaraderie amongst the lucky few allowed in. Cheryl stands in one of the side channels to The Wave’s main gully. After eating a quiet lunch while taking in The View – eyed by a cautious raven – we spent an hour or so exploring the area above “The Wave”. While not as stunning as the gully itself, there are plenty of interesting features within a few hundred yards. We were surprised to see a number of small pools of water nearby, and even more surprised to see they were teaming with tadpoles, insect larva, fairy shrimp, and even a few small fishes. We could only imagine that the water table below the now-dry waterfall was sufficiently near the surface to prevent the ponds drying up within hours in the hot sun. Teaming with life, a pool of standing water just above The Wave. The water is very likely brine. This water is apparently a remnant of the history of the formation. The gully was originally carved out by streams that cascaded down from the cliffs above, but in more recent time, the watercourse has shifted, and the gully has been sculpted by the prevailing winds. During our lunch, there was a good breeze blowing through it. 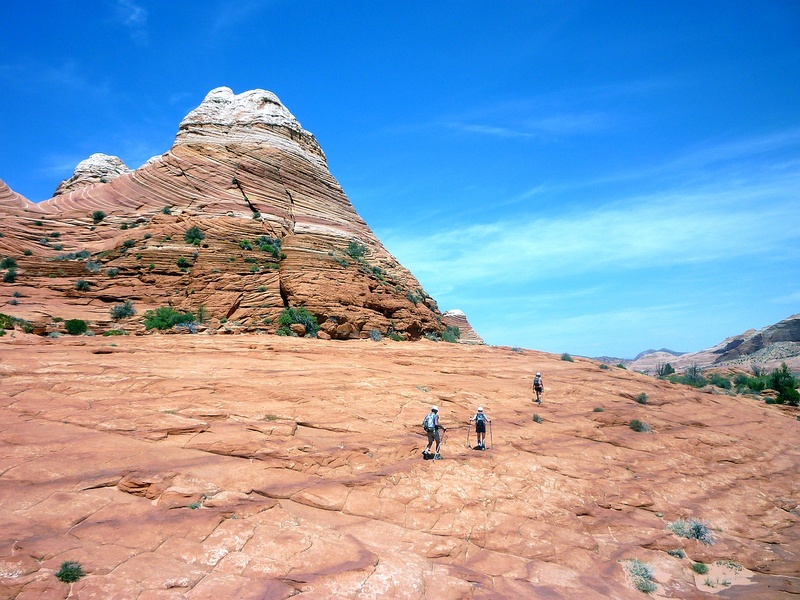 The layered rocks themselves are sandstone laid down over 150 million years ago. At that time, this area was the center of an enormous equatorial desert of reddish sand. Much later, water leaching through the rocks would sometimes bleach iron from alternate layers, resulting in the dramatic stripes. Our companions and we standing in the main part of The Wave. Heading back required a similar process using waypoints and compass bearings. 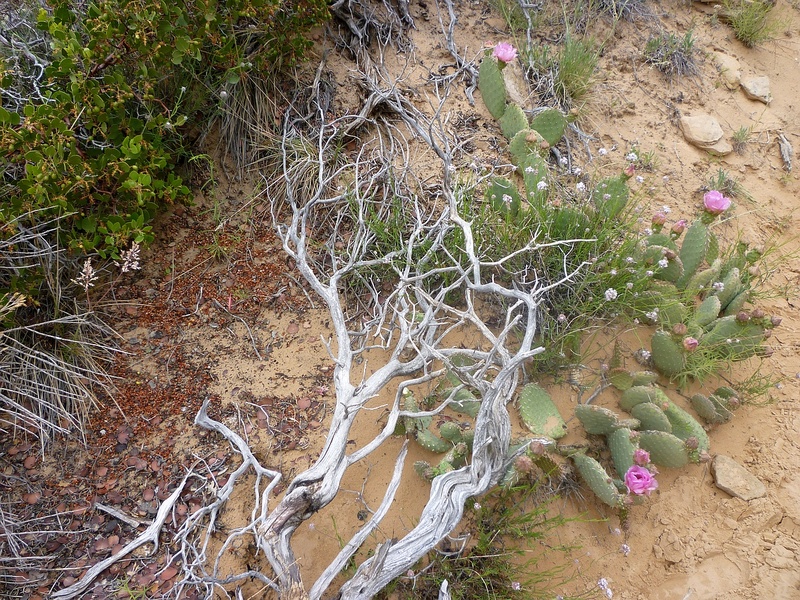 The BLM map included photographs and readings for the return journey as well. One would think that retracing one’s steps would be easy, but it’s good not to get too cocky when close to home. 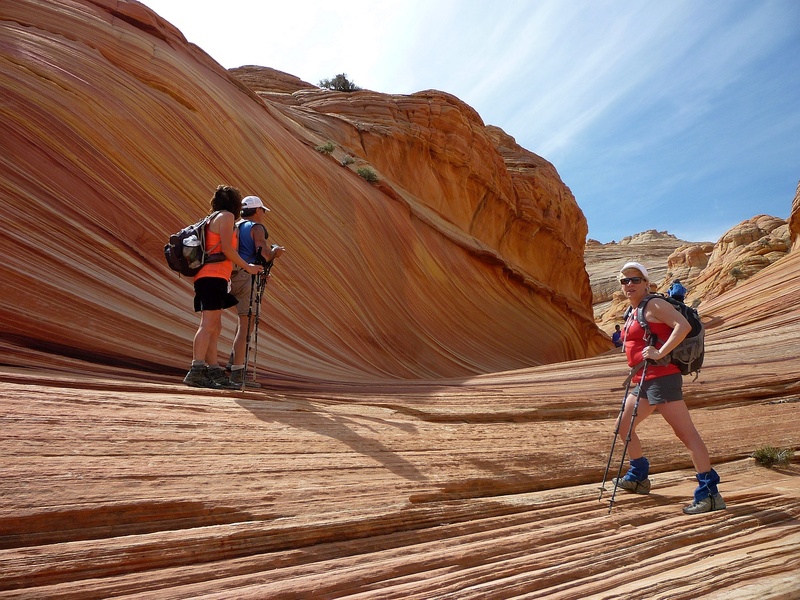 The ranger had told us yesterday that more people got off the path on the return journey, especially where the path veers left to go over the saddle near the end of Coyote Buttes. Veering too soon could lead us into a steeper descent than we’d like. Veering too late could have us down in the lowlands where it would be harder to orient ourselves. 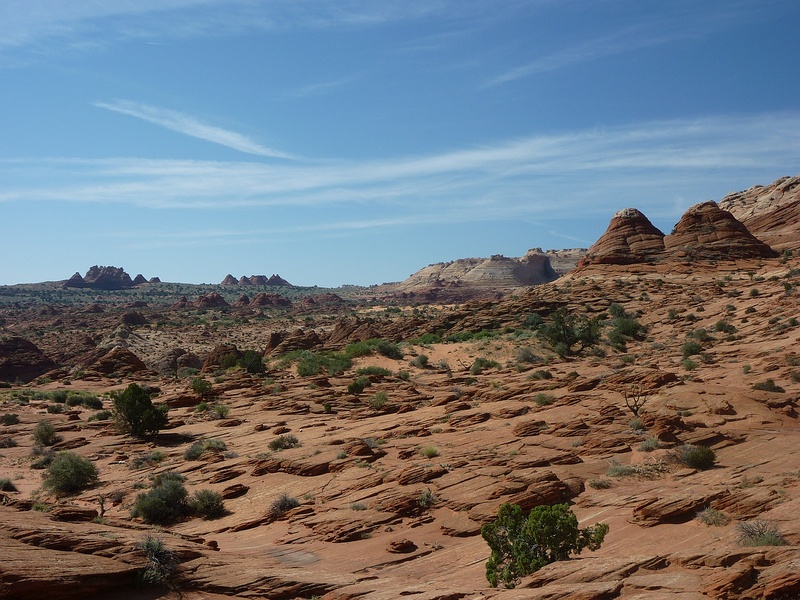 Or even lead us to the sheer edge of Buckskin Gulch, which would present challenges of its own. Beginning the trek back from The Wave, distracted by visions of cold beer and nachos at Escobar’s. Sure enough, as we headed up the hill, we began to disagree about the exact route. It’s interesting to see how the brain starts to see patterns and resemblances wherever it looks, and soon each of us was sure of the correct saddle – except there were at least three of them. Soon, two other couples caught up to us and added to the disagreement. I was quite convinced we had gone past the correct saddle, while others thought we needed to go farther still. Six of us eventually continued up the route we were following, and the other two opted for another route. None of us were too concerned about getting lost as we could see the large limestone hills that we knew to be behind the parking lot. Still we knew we could easily spend a couple of hours wandering around in the growing heat. A reminder that not everyone survives out here in the desert. As we came down the other side, it was clear we had not returned by the same saddle we’d come up. However, by following to the left the small wash at the base of the hill, we soon got back to the trail, which is clear enough at that point. The rest of the trip back to the car was uneventful. But even in hindsight, I doubt we four could all agree on exactly by which route we’d returned. 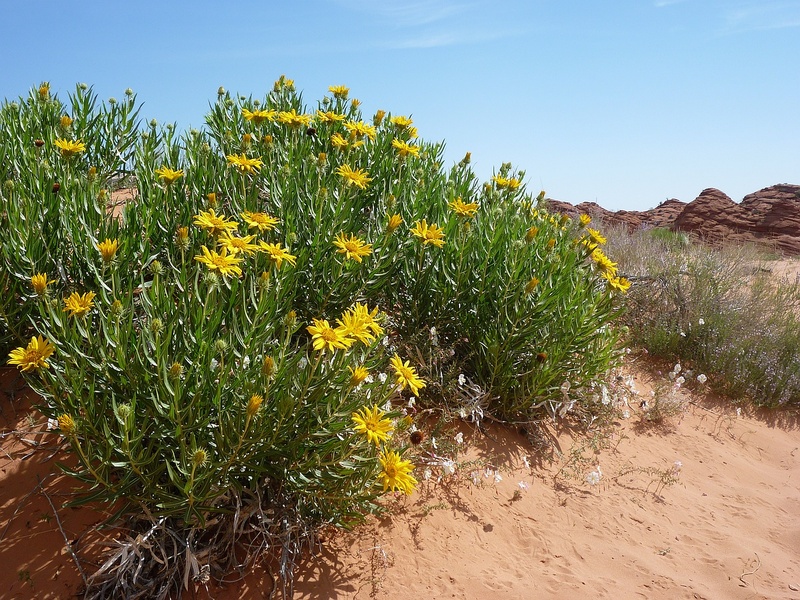 Away from the bare rock, more desert flowers blooming in mid-May. As we left the parking lot, we passed the ranger coming in for the afternoon. Since each car needs to display a copy of its permit, there would be a good indication of who had not returned by nightfall, and in what area they would be. So if you get lost, someone might come looking. 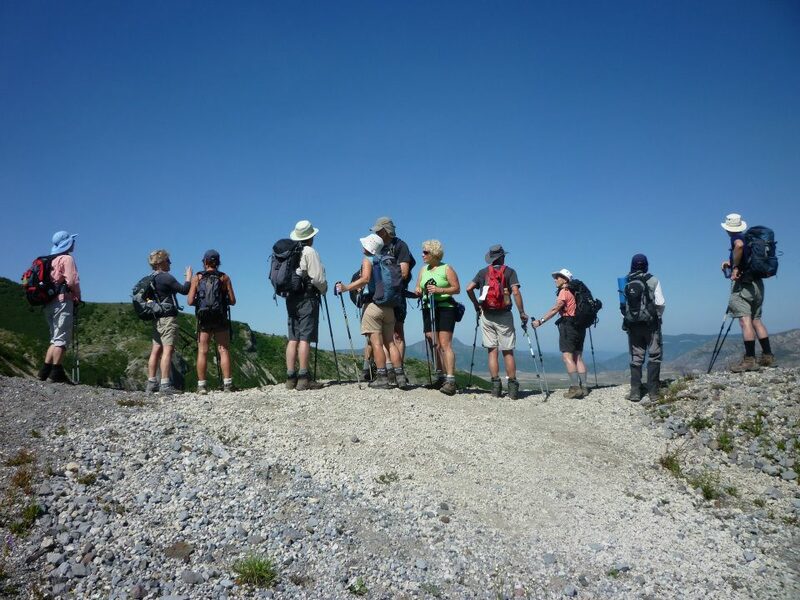 However, if you don’t feel comfortable with that possibility, it’s recommended to hire a guide for the hike. And take lots of water. 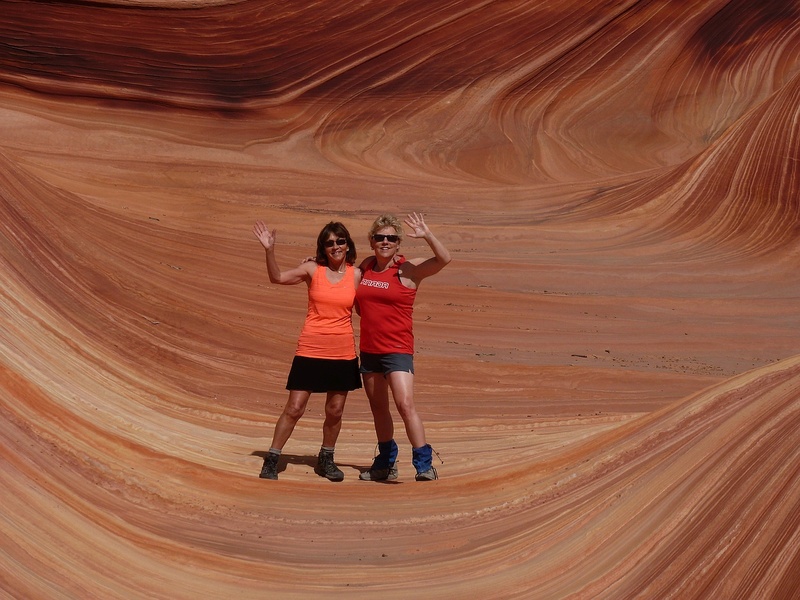 Celebrating our luck in winning the chance to hike into The Wave in Arizona. At the end of the day, we still felt incredibly lucky to have won the lottery to visit “The Wave.” With our chances having been about one in twenty, we hadn’t really expected this outcome. We heard a rumour that if you fail to win a spot, and return to try again each subsequent day, you will be awarded an additional ball each day, up to a maximum of five balls. That would probably give you a fifty-fifty chance of getting in by the fifth day. However, I was not able to find a reference to this online. Another option is to enter the online lottery for one of the other ten spots, something you need to do several months in advance. Good luck! 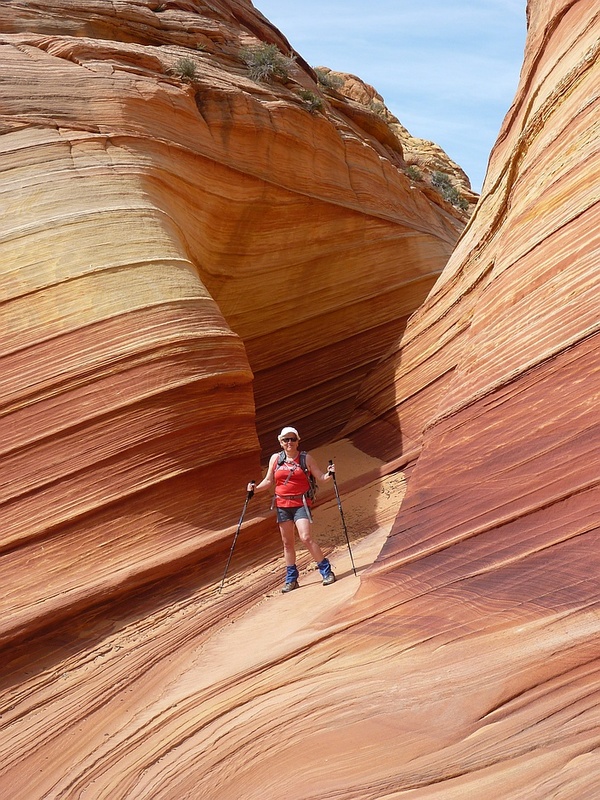 Cheryl posing in front of the unforgiving terrain that guards The Wave. 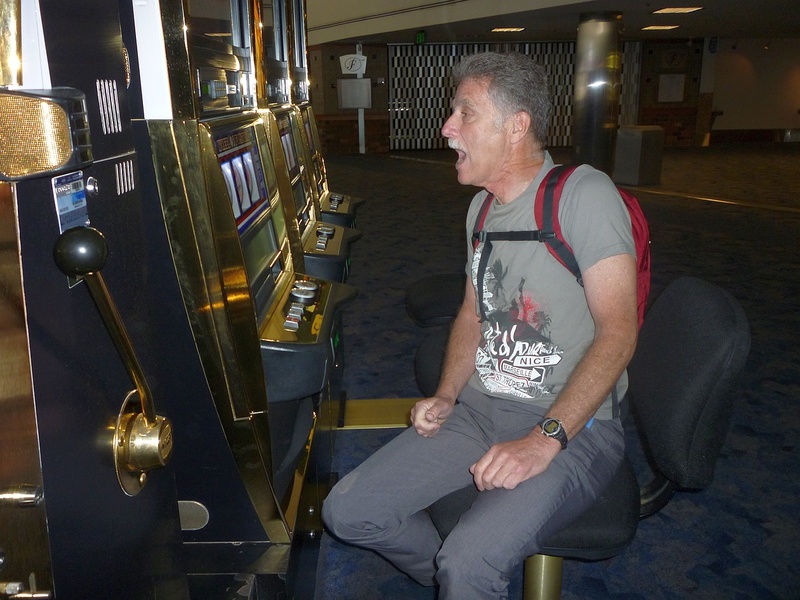 On the way back through Las Vegas airport, I finally got to try my luck at the slot machines. Gambled and lost a dollar and that was enough for me! I guess I’d used up all my luck in Kanab. A few days before our trip, we received an unusual request through the Couchsurfing site. A young couple in Poland were getting married, and the bride’s brother was creating a video with best wishes from all over the world. We offered to send our greetings from our home town, but thought it would be a nice touch to send personal greetings from Zion and “The Wave” as well. So we had some extra fun putting those together on the hikes. What?! I knew I should have bet on 13. Waving from The Wave – all the way to a Polish wedding! 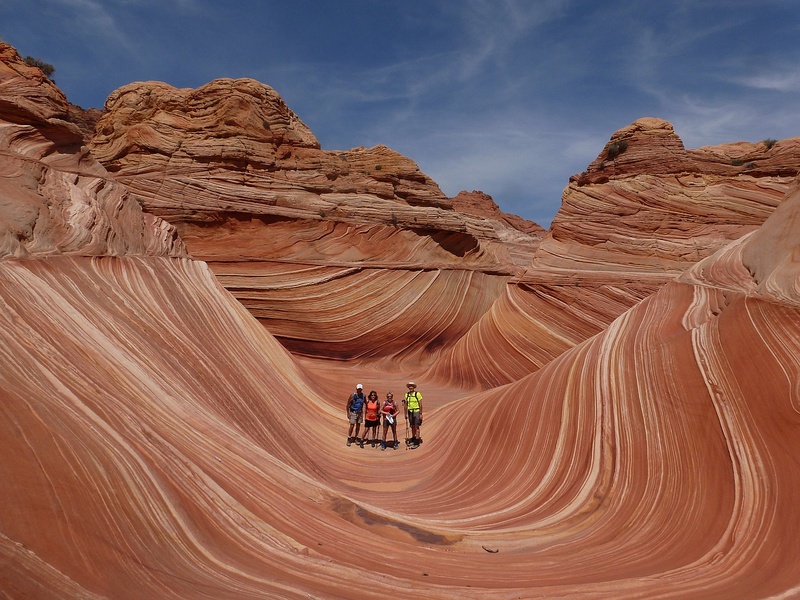 This entry was posted in Travel and tagged Arizona, Coyote Buttes, Group Travel, Hiking, Kanab, Outdoors, Recreation, Safety, The Wave, Utah on May 17, 2015 by "No Pension, Will Travel!" with Cheryl + Paul. We didn’t win in Las Vegas, but we came up lucky while hiking in Utah. Friends Darcy and Marty had planned a return visit to some of the areas they’d visited years before, and asked us to come along. Since Cheryl had no new contracts pending, we took up their offer at the last minute; one of the perks of the “No Pension Will Travel” lifestyle. The expected view from our first destination. We flew discount airline Allegiant from Bellingham to Las Vegas. Their prices are low, but watch those extras. The default seating arrangement appears to ensure that couples are not together, and there’s an “upgrade” charge to move even one seat over. The rumoured fee to use the toilet was hyperbole. We arrived in Vegas in the late evening, giving us just enough time for a driving tour of The Strip. This was mainly for my benefit, as the other three had each been to Vegas several times before. 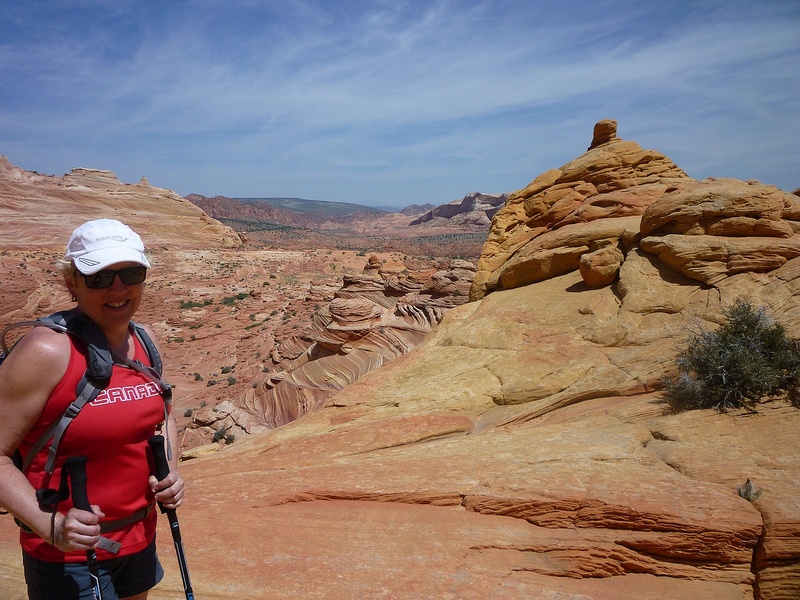 I remarked how much Las Vegas resembled a “Disneyland for Adults.” However, I missed my chance to thwart the one-armed bandits; early next day, we headed out for the three-hour drive to Kanab, Utah, planning a stop in Zion National Park for a hike up to Observation Point. Part way up, Cheryl contemplates the remainder of the ascent to Observation Point. I’d been wondering what Darcy had in store for us. About my age (and just as young looking), Darcy had recently run the Boston Marathon, and won her age group in a local half-marathon. She isn’t known for shirking a challenge. 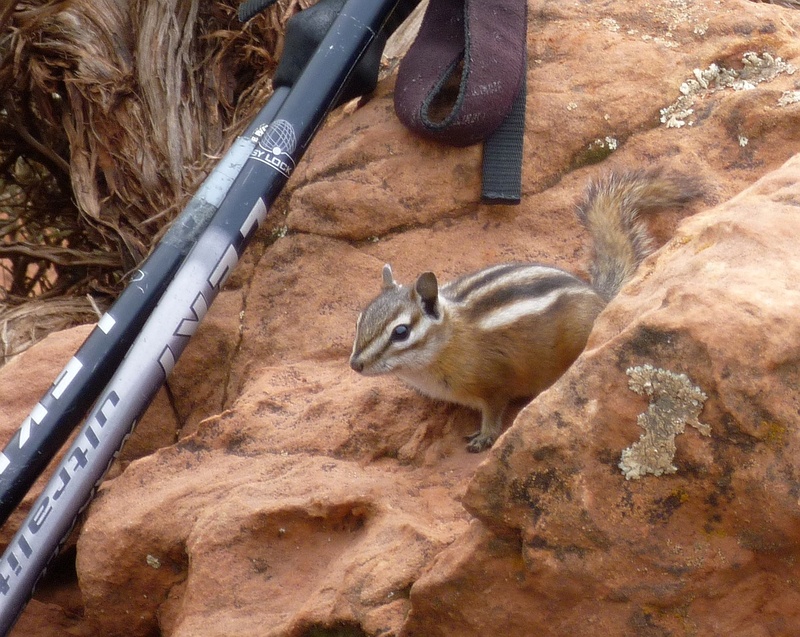 As a less experienced hiker, I thought I’d check out some of the hazards of hiking in Utah. Rattlesnakes, perhaps? Yes, there are some, but some of the biggest dangers are falls, dehydration, and flash floods. All can be mitigated with careful planning. And, as with most travel, driving is probably the top risk. Much of the ascent to Observation Point looks like this. 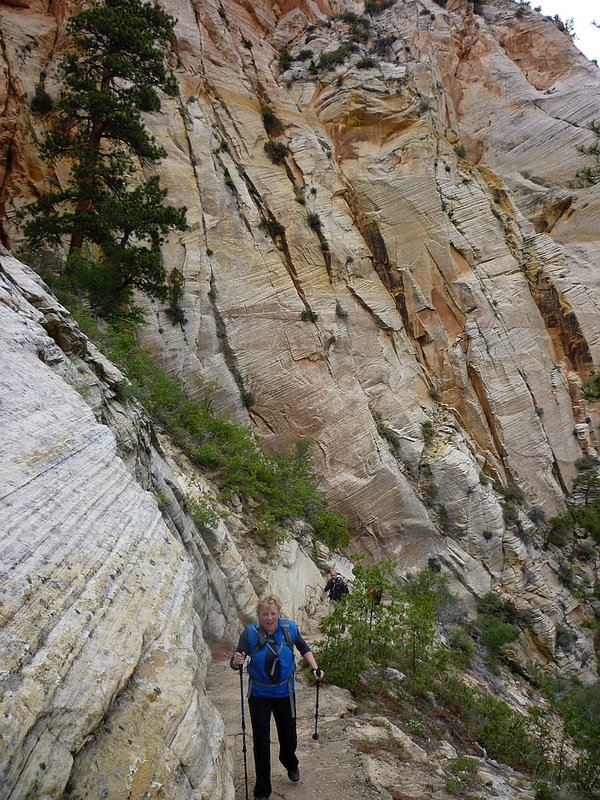 I did see that Angels Landing in Zion had made it onto at least one list of “20 Most Dangerous Hikes.” Then I learned that Darcy had done that hike last time. 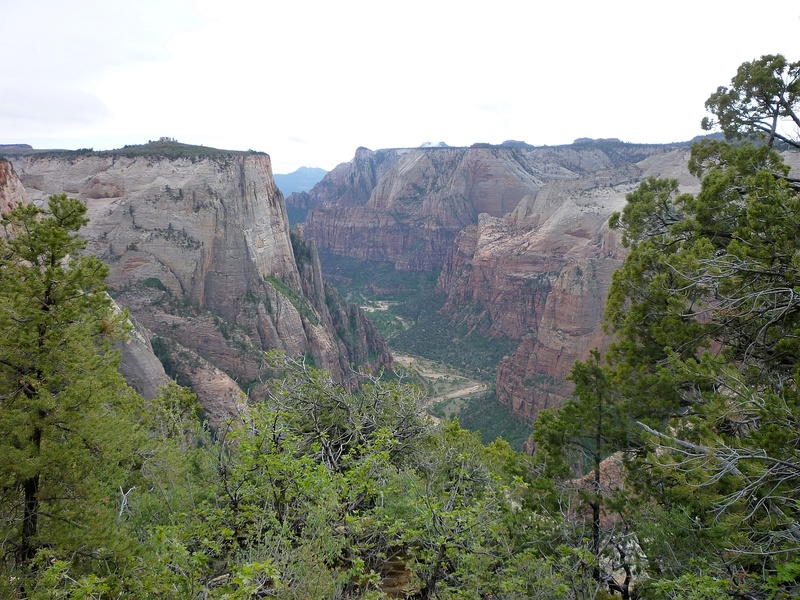 “Observation Point is easy by comparison,” she said, although I wondered about “easy by comparison.” It’s an eight-mile round trip, with 2100 feet of elevation gain, the endpoint looking down on Angels Landing. The footing is smooth, making it doable if you’re used to those kinds of distances; we made the return journey in well under the suggested time of five hours. 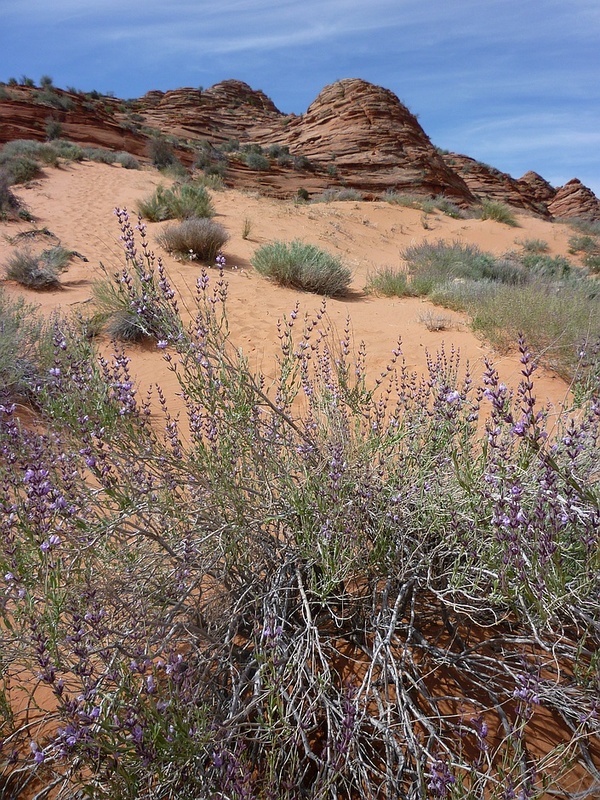 May was a great time to see wildflowers on all four of our Utah hikes. 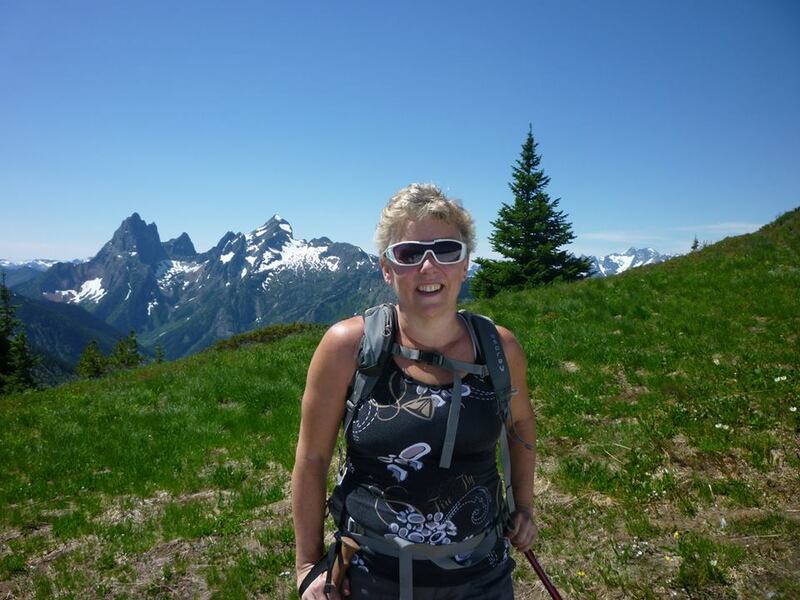 This was Cheryl’s first hike since recovering from a running injury, so she was monitoring her body’s reactions to the climb and descent. Happy to say, it went well, although her legs complained to her the next day about the shock therapy. 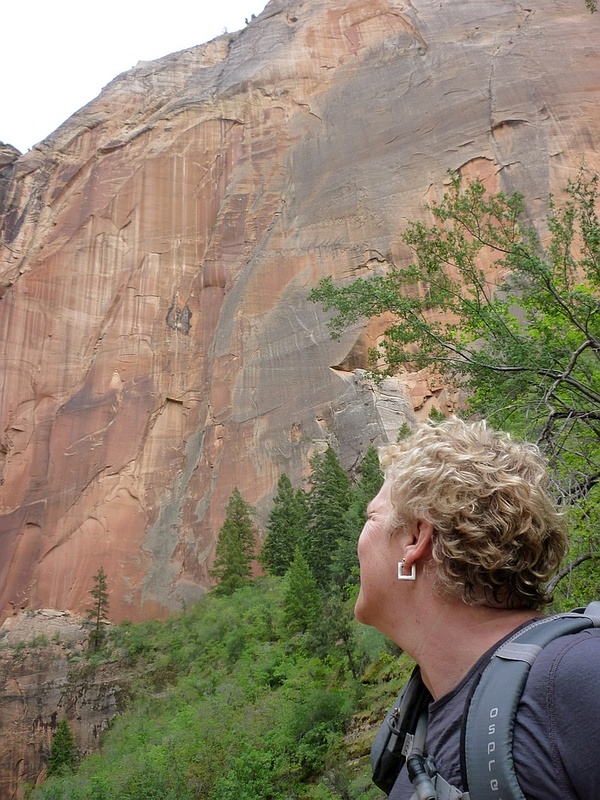 I’m prone to vertigo – it’s a family trait – and there was about 20 minutes of uphill and about 45 on the return, when I found myself hugging the cliff side. The ledge was probably four or five feet wide at this point; most people wouldn’t be bothered. Still, I kept a watchful eye on the weather. I wouldn’t have enjoyed coming down during a blustery rain storm, and the rangers were divided on whether it would rain again before it cleared that evening. Lucky for us, the clouds began to lift, and we had only expansive views to contend with. This little guy joined us for lunch. We also saw mule deer and wild turkeys in Zion. Our home base in Kanab was the funky Parry Lodge, on the National Register of Historic Places. The rooms and lobby are plastered with photos of the many stars who came here to film westerns, mostly from the 30s through the 60s. With reasonable prices – about half of those charged in other areas around Zion – the Lodge was fully booked every night. The service was friendly, and even included packing us five-dollar box lunches that were big enough to share. It’s a busy kitchen, so if you have special dietary requirements for your hike, it’s best to write them out beforehand. Watching our step, heading down from Observation Point. 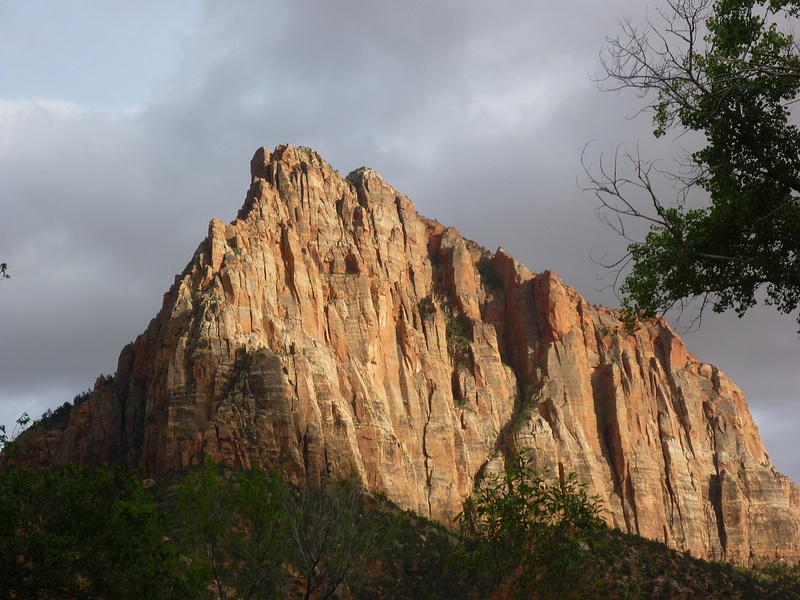 Late afternoon sun illuminates a peak in Zion. names, origins, and ball assignments. I wished aloud for my lucky number, 13, and we thought it a good omen when we were assigned that ball. The packed hall fell silent as the hopper was spun. I wondered what we’d do if we only won spots for half our party, but Cheryl refused to speculate. Then, the first ball out was lucky 13 and we whooped and hollered like Vegas winners. The ten chosen hikers stayed behind to get maps and detailed instructions on how to find “The Wave” tomorrow. We learned that hikers occasionally failed to find it, and many get off the trail while returning. So, listen up! 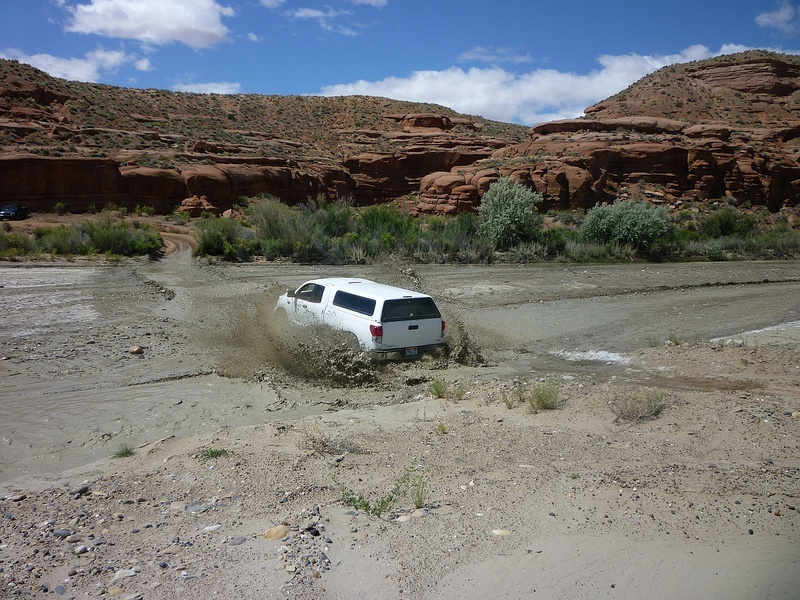 These campers returned the next day to find Wahweap Wash dry no more. This hoodoo-like peak is as close as we got to the Wahweap Hoodoos. We consoled ourselves with a stop at the Toadstool Hoodoos, an easy few minutes from the highway. Marty thought there were fewer hoodoos at Toadstool than he’d remembered, and we speculated on whether erosion or human agents were to blame. 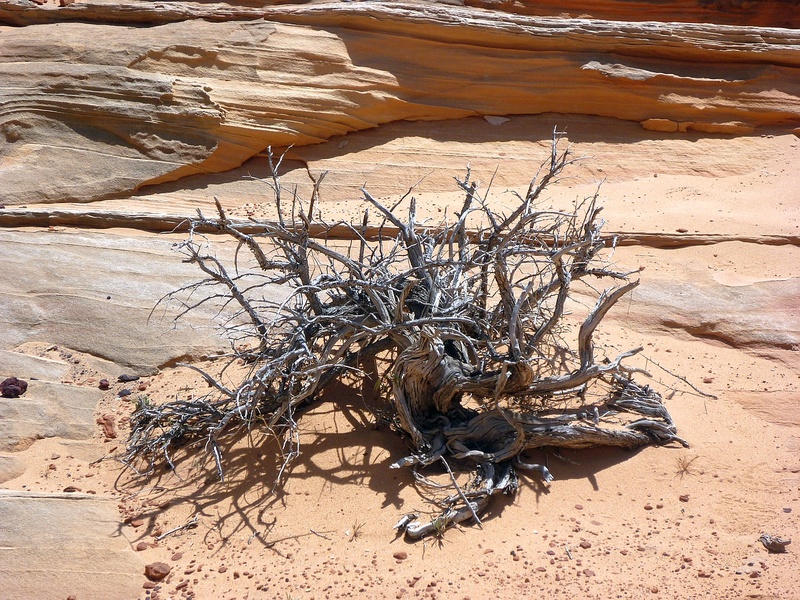 We later learned there has been vandalism in some of Utah’s hoodoo sites. What a shame! 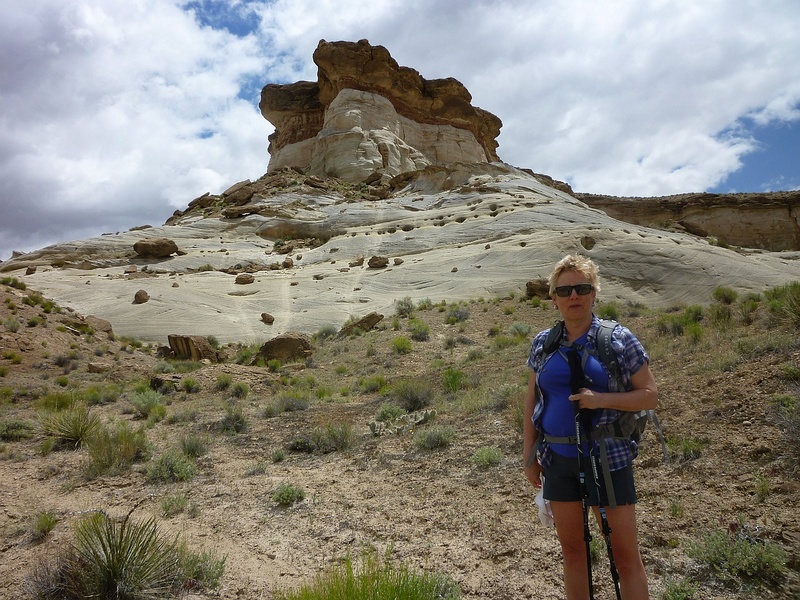 The approach to Toadstool Hoodoos was picturesque. We dined that evening at Escobar’s Mexican Restaurant, where copious good food is served with ample good cheer. It’s a small place, and popular, so waits are likely. Bellies stuffed, we returned to Parry’s Lodge to dream of “The Wave” – with the occasional nightmare about failing to find it. 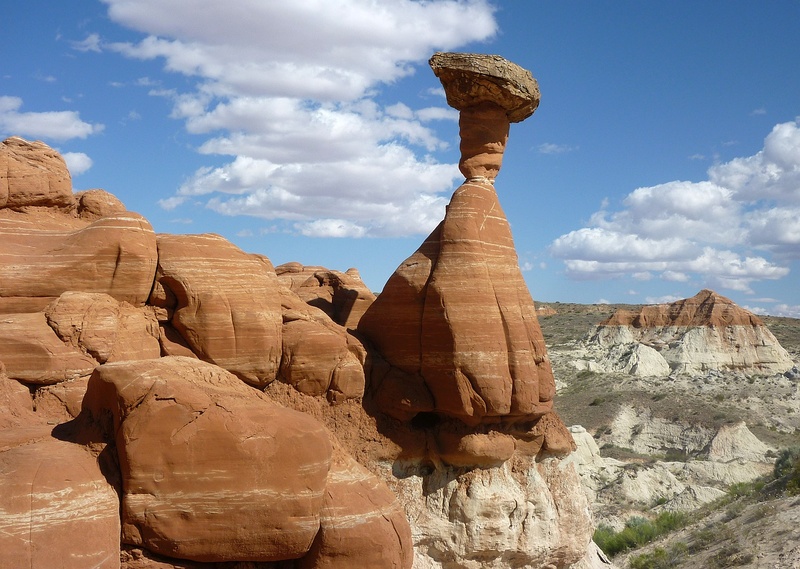 One of the Toadstool Hoodoos looks precarious. With so much to see, it was hard to remember to look down, but there were flowers everywhere. 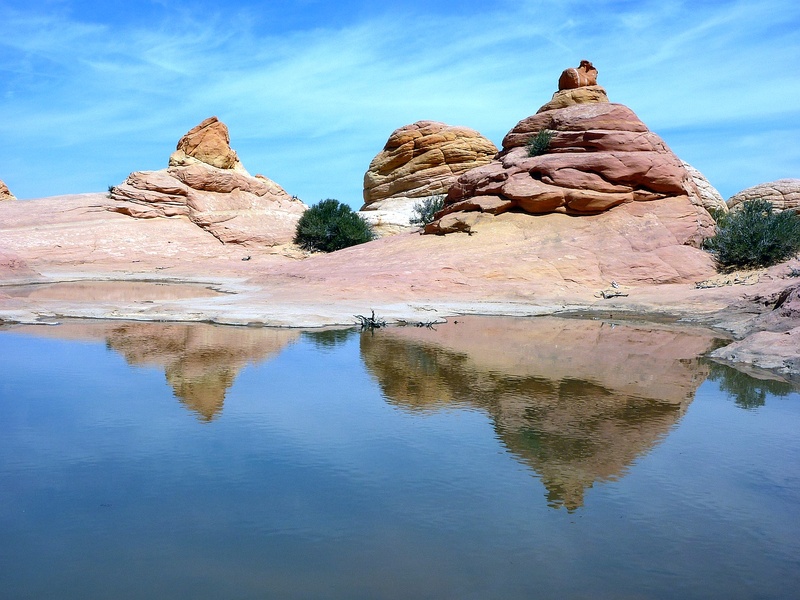 Waheap Hoodoos – please tell us what we missed! Almost everything seemed to be in bloom. 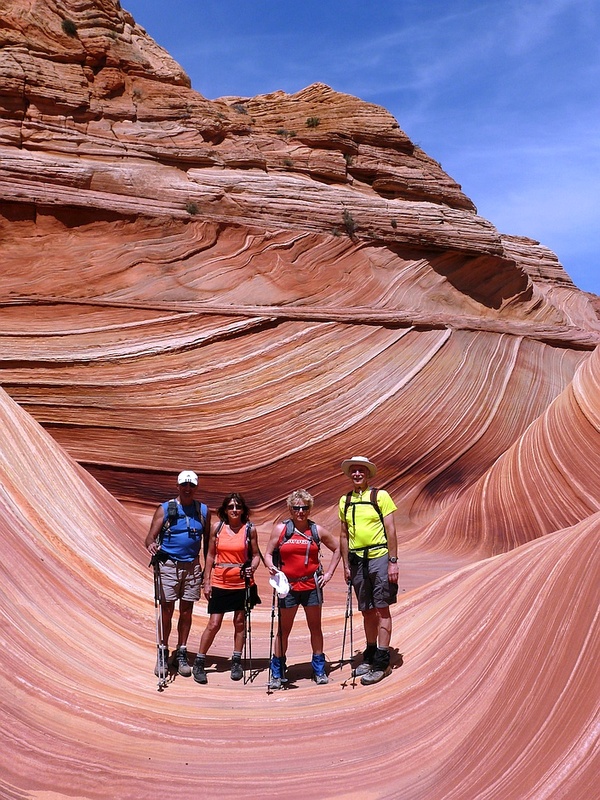 This entry was posted in Travel and tagged Arizona, Coyote Buttes, Group Travel, Hiking, Hoodoos, Kanab, Las Vegas, Observation Point, Outdoors, Parry Lodge, Recreation, Safety, The Wave, Utah, Wahweap, Zion National Park on May 14, 2015 by "No Pension, Will Travel!" with Cheryl + Paul. It was our first hike in our second season with the local outdoor club, and we’d just made it up to the top of a pretty big hill. A mountain, in my lexicon. (Technically, it was our second hike of the year, but we didn’t think the popular New Year’s Day “hangover hike” counted.) Coming back down proved to be our undoing. We limped around the house for three days, helping each other up the stairs. By the next weekend, however, we were ready to try a higher peak. We did like to get out for shorter hikes with a few friends. Now the years were taking their toll on our circle – with injuries, operations, and just plain lethargy. At times, we couldn’t find a single person to accompany us on a weekend hike. With some trepidation, we found and joined a local Outdoor Association and booked ourselves on one of their upcoming outings. We fully expected to be the “slowpoke seniors” in a group full of energetic youths. Much to our surprise, we found ourselves among the youngest on the trip – although it took us a few hikes to get past the “slowpoke” part. 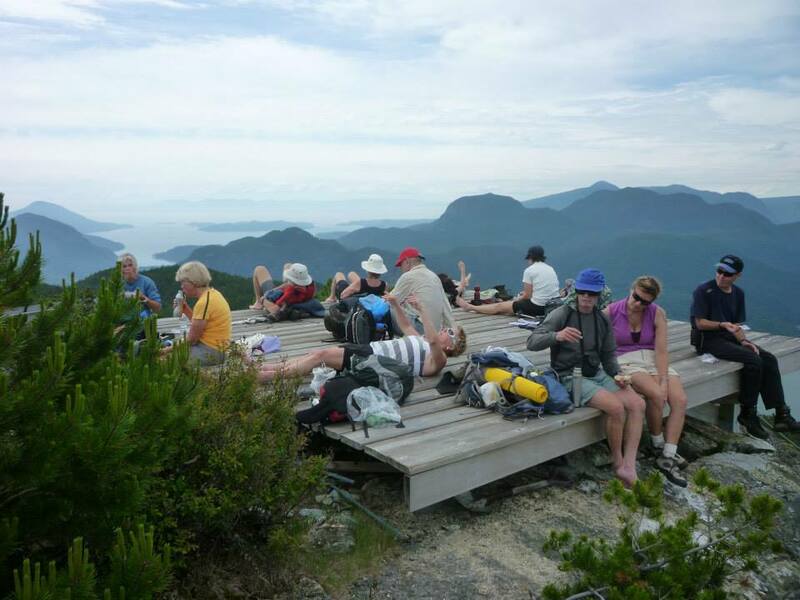 As we’ve continued to do hikes and bike trips with members of the group, we’ve met close to 100 of the 250 members, and almost all of them are our age or older. So many of these hikers and cyclists are inspirations! 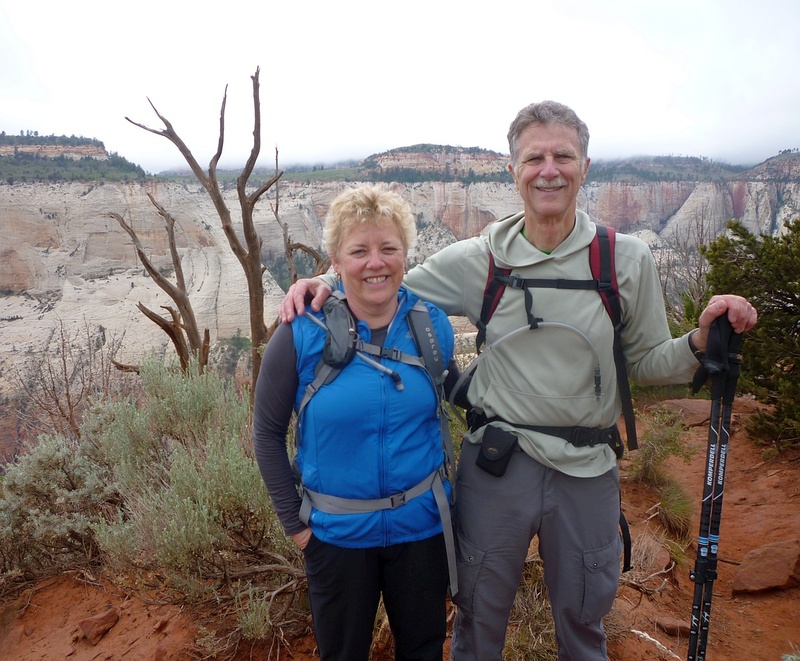 It’s quite something to spend six or seven hours hiking up and down mountain terrain only to discover the septuagenarian we’ve been struggling to keep up with has two titanium hips or knees. The senior hard on my heels has just done her 100th marathon. 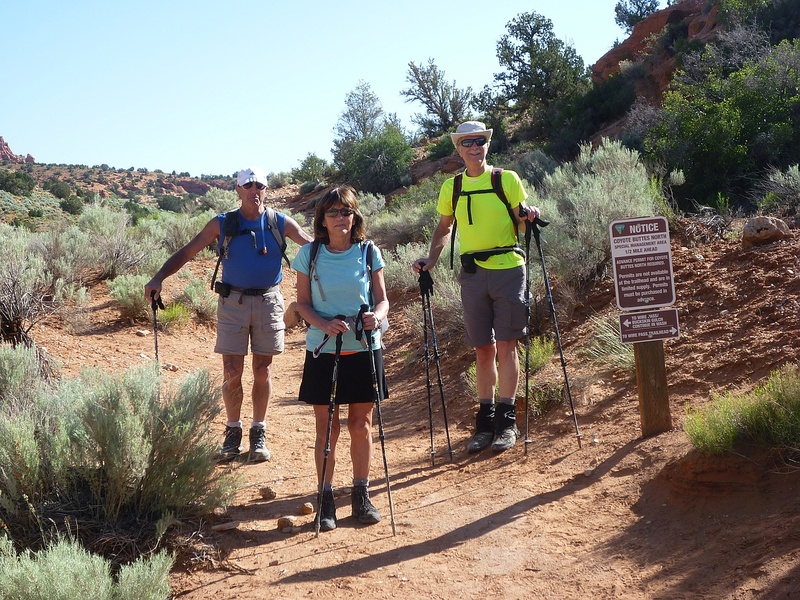 Some members in our club, often retired for decades, have medical conditions that would keep most people chained to their easy chair – instead, they’re using a bit of chain to get past a few feet of scree on a mountainside. So we’ve been inspired! We’ve done a number of hikes we would never have done on our own. We cycle 40 miles or more on a Saturday ride without giving it a second thought. We’ve been camping again – so far just tailgate camping, with folding cots in the tent. The surprise was how we fell into a new community of people in our stage of life, either retired or contemplating retirement. 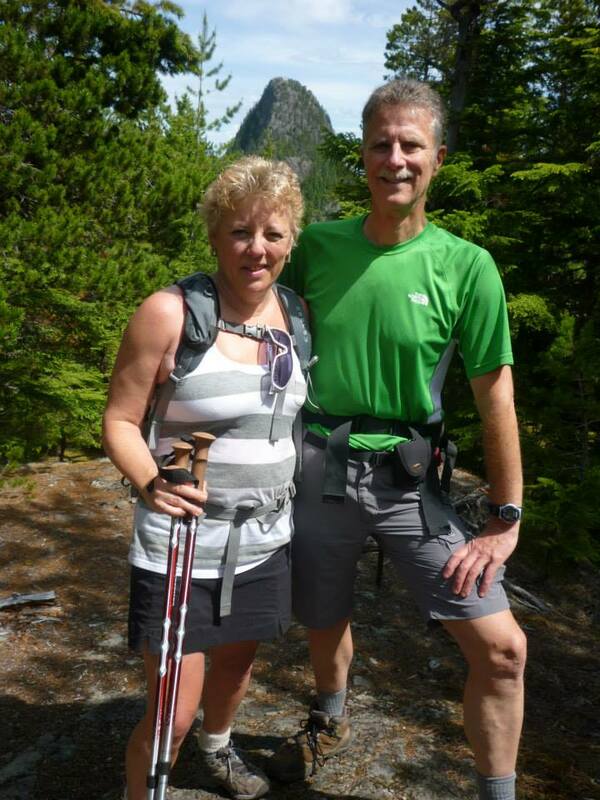 Not a retirement of slowing down – instead, one of taking on new challenges and adventures. Many we’ve met share our passion for “back roads” travel, and many of those have found creative ways to finance their lifestyle. We’ve also been reintroduced to travel in our own part of the world. 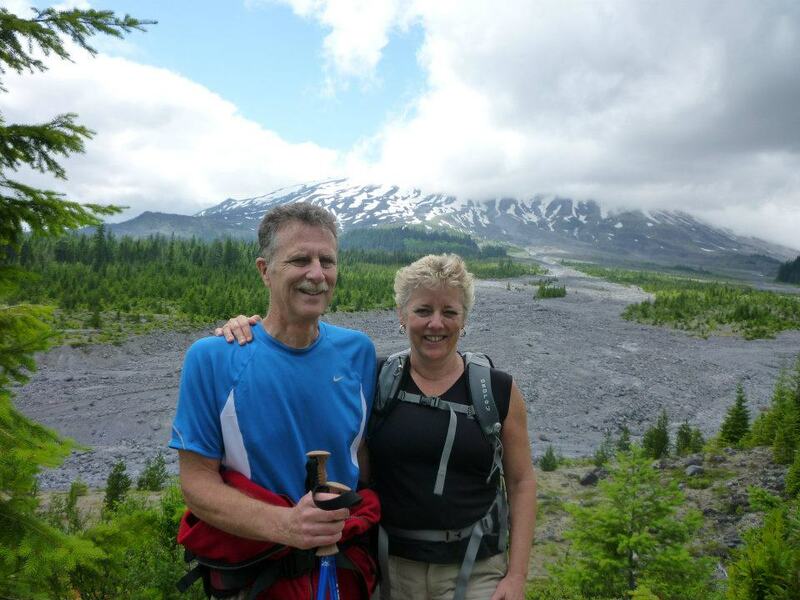 In search of new horizons, volunteers in the club have put together multiday hiking or biking adventures in locations from the Mexican border to Alaska – plus the occasional one overseas. Much as we’ll continue to visit other continents, we now foresee more travel close to home. 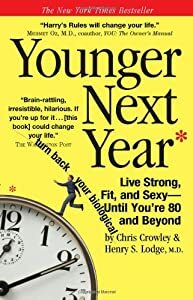 We’re also seeing that we won’t have to settle for being “slowpoke seniors” – we’ve got lots of counter-examples all around us, and we’re starting to catch up. 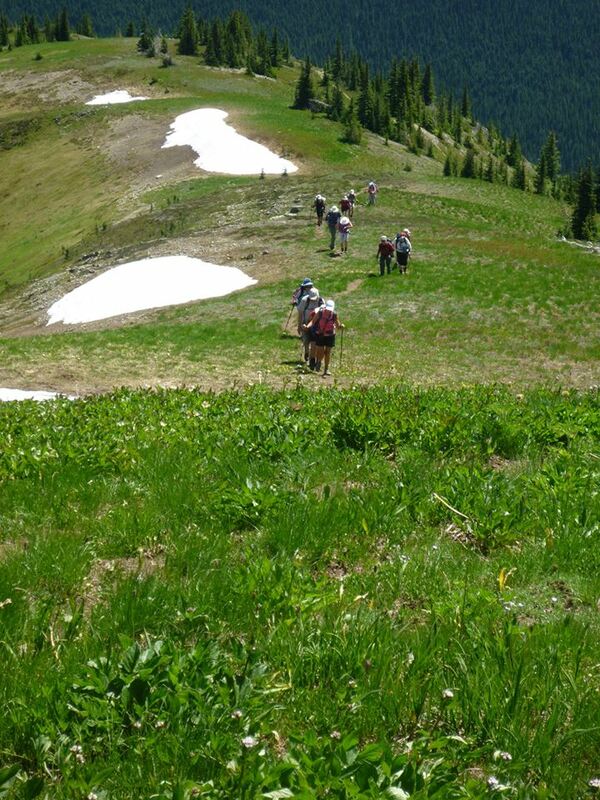 At this year’s “summer camp,” Paul read over “Younger Next Year,” and has started this program, using the burst of summer hiking as the “kedge” to jump-start his program. Today, we head out to a four-day kayak camp. For next year, we’re looking for a hike or cycle route that we’d feel confident leading. That would be a first for us. We’ve also found a some members who are interested in joining us on our next year’s European bike trip: a solution to the dilemma posed by our Provence trip earlier this year. We found our group by doing Internet searches for “hiking club” and the like. It turns out there were quite a few in our City, including special interest groups like “dog-friendly hikers.” We picked ours primarily based on the region it served. We’ve since discovered that many members belong to more than one group, so finding one quickly leads to others. Many states and provinces have umbrella associations for various outdoor groups, and often publish directories. However you do it, joining an enthusiast group of active hikers or cyclists will get you out there when you just “don’t wanna.” Try it out. And see you on the mountain! 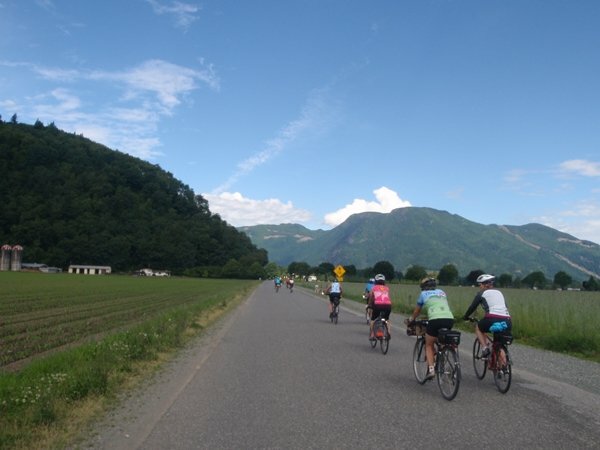 This entry was posted in Community and tagged 50+, Bike Tours, Cycling, Group activity, Group Travel, Health, Hiking, Meetup, Outdoors, Recreation, Retirement, Travel, Zoomer on August 9, 2013 by "No Pension, Will Travel!" with Cheryl + Paul.